A lot of this has been mentioned in other threads, but here's the official rundown from the desk of Marc Whitten (General Manager of XBL). · Xbox SmartGlass. This is a brand new Xbox innovation that makes your entertainment smarter, more interactive and more fun – across the devices you already own. It makes your tablet or your phone more intuitive, so if you are watching a movie or playing a game on Xbox 360, relevant content will automatically appear on your SmartGlass device. Imagine having the ability to pick your plays from your tablet instead of the TV screen during an intense game of “Madden,” keeping your next move a surprise to your opponent. Imagine meeting up with a boss in “Ascend” and seeing all the necessary details appear on your phone to help defeat it. Or, turn your favorite tablet or phone into a great remote control for your Xbox console.We’re excited to make all this possible for you and more. What do Alice Cooper, Metallica, LeBron James, and “Mortal Kombat: Legacy” have in common? They’re all coming to Xbox! Between Machinima launching in every Xbox LIVE market around the world, the inspirational animated series “The LeBrons: Season 2” launching on Xbox Video, and the Revolver Golden Gods Awards show streaming live via our Events Player, there are some really cool new things to check out this week. Additionally, if you’re a fan of electronic dance music (or EDM as it’s more commonly known) you’ll enjoy new details about our partnership with OneBeat Labs. Today, the No. 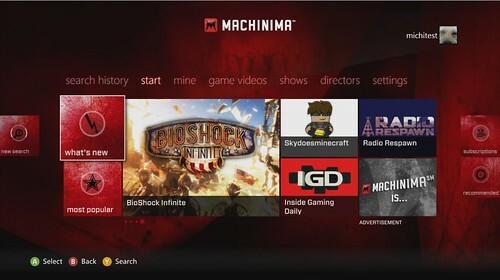 1 entertainment destination on YouTube, Machinima, comes to Xbox 360* across all Xbox LIVE markets. The first app to launch worldwide on Xbox, Machinima gives you an easy, all-access pass to watch episodic narrative series like the extremely successful “Mortal Kombat: Legacy” and “Halo 4: Forward Unto Dawn”, live streams, gameplay videos, and original content, including weekly and daily shows such as fan favorites “Sanity Not Included” and “How to Annoy People.” As the top global online video destination for young males, you won’t want to miss downloading the Machinima app and getting instant access to all of your favorite Machinima channels, including the main “Machinima” channel, which is one of the largest YouTube channels, “Machinima Realm” focusing on fantasy and role-playing games, and “Machinima VS“ covering the world of competitive gaming, just to name a few. Machinima speaks directly to the gaming audience and beyond, providing a destination to watch your favorite content in the comfort of your living room, or any location you choose. With Machinima on Xbox, you can also share videos directly from the app to Facebook. Check it out and download from the Xbox LIVE Marketplace now. 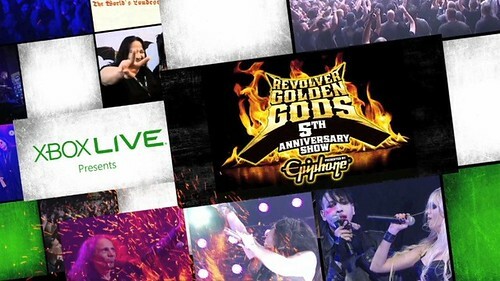 The 5th annual Revolver Golden Gods Awards Show in Los Angeles is back with some of the biggest names in hard rock and heavy metal. Planning to tune in and turn up the volume? You’re in luck. Xbox LIVE Gold subscribers around the world** will be able to stream and rock out to the show live right from their Xbox 360 this Thursday, May 2. Watch heavy metal favorites Metallica, Halestorm, Stone Sour and more perform live. See Rob Zombie receive the award that embodies the spirit of hard rock and metal, the Golden God Award and Metallica receive the iconic Ronnie James Dio Lifetime Achievement Award. The show starts at 8 p.m. PDT. You can also watch the “Black Carpet” pre-show special starting at 7 p.m. PDT and catch glimpses of legends like Gene Simmons, Marilyn Manson and Alice Cooper. The Xbox LIVE stream will also run a dedicated Twitter feed across the screen using the hash tag #XboxGoldenGods so that the Xbox community can make its voice heard and weigh in on all the action in real time. The “Black Carpet” kicks off at 10p ET/7 p PT on Thursday. The hit animated web series “The LeBrons” is back with season two, and will be exclusively available on Xbox 360 in the U.S. via Xbox Video starting Friday, May 10th. Watch new episodes each week and a handful of trailers through August 31st, and listen to the original music soundtracks for seasons 1 & 2, all found in the dedicated “The LeBrons” hub located in the TV & Video section of the dashboard. “The LeBrons” is a family entertainment show that provides positive life messages to today’s young adults and is co-executive produced by LeBron James, Maverick Carter and Believe Entertainment Group Co-Founders Dan Goodman and William H. Masterson III. In the meantime, here’s the latest trailer of Season 2 of “The LeBrons.” Check back next Friday for the first episode. We’re working with our friends at OneBeat to bring one of richest cultural experiences today exclusively to Xbox—Electronic Dance Music (EDM). We’ll have more details to share next month, but know that we we’ll soon be launching the OneBeat app for Xbox 360 which will bring some of the richest, and most integrated, interactive entertainment experiences from the Global EDM Industry right into your living room. The OneBeat app is a one-stop shop and portal for EDM artists and fans and will connect fans by enabling content sharing across Facebook. At launch, you can check out the calendar of events, artist information, event details and even ticket sales.